Indium Corporation announces a new technology platform using the SACm™ solder alloy that satisfies the continuing demand for cost-effective reliability requirements of portable electronic devices. SACm™ solder alloy offers drop shock performance far superior to other SAC alloys, without compromising on thermal cycling. Its low silver content makes this a cost-effective solution for portable electronics. 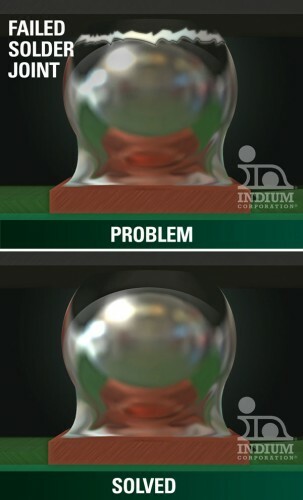 The platform consists of Indium8.9 Series solder pastes using Indium Corporation’s patented-pending SACm™ solder alloy technology for board-side interconnect, and SACm™ solder balls (spheres) for package level interconnect. SACm™ solder alloy technology addresses these challenges. “SACm’s stable, micro-structural improvements to the intermetallic compound layer of the solder-to-pad interface are impressive. We see a fine grain size with a thin, stable IMC layer, even after exposure to accelerated life conditions. These micro-structural improvements translate into an 8X (800%) improvement in drop-shock performance and 50% extension in thermal cycling,” said Dr. Ning-Cheng Lee, Indium Corporation’s Vice President of Technology. The portable electronics industry is faced with the ongoing challenges to: improve drop-shock performance without sacrificing thermal cycling performance; reduce the need for expensive board-level underfills (and the associated material, process and re-work costs), as well as the inability to even reach some areas with underfill; and reduce costs by extending wafer-level package size to larger areas, enabling higher functionality of the low cost-per-I/O package. Solder joint architectures that utilize both SACm™ solder paste and SACm™ solder balls can maximize reliability benefits with enhanced interfaces for both solder-to-package and solder-to-printed circuit board. Indium Corporation is a premier materials manufacturer and supplier to the global electronics, semiconductor, solar, thin-film, and thermal management markets. Products include solders, and fluxes; brazes; sputtering targets; indium, gallium, and germanium metals and inorganic compounds; and NanoFoil®. Founded in 1934, Indium has global technical support and factories located in China, Singapore, South Korea, the United Kingdom, and the USA.